Hi friends and happy Saturday! How are you enjoying June so far? I'm sure loving it and I'm looking forward to warmer weather here in the Pacific NW over the next few months. Today I have a fun and unique style card called the "side-step" card. Take a look! I haven't made one of these side-step cards in years and I was a bit rusty. 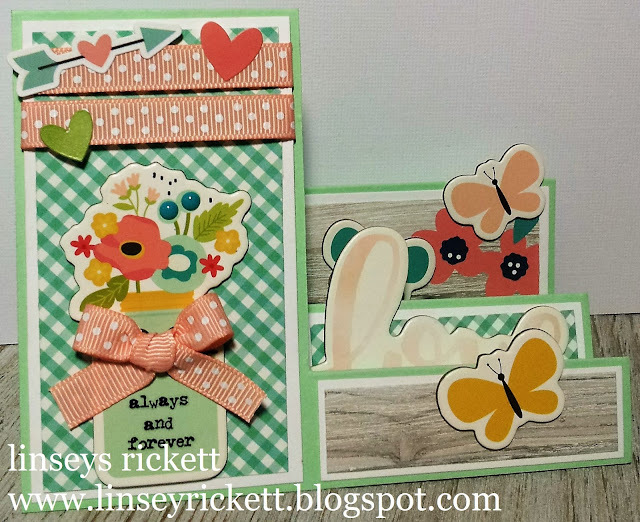 But with the SplitcoastStamper's Side-Step Card Tutorial, it was easy and as pie! I added 2 strips of the Select Swiss Dots Grosgrain in Moonstone across the top main panel and a little bow over the mason jar. This ribbon is part of the June Ribbon Club Assortment and it can also be purchased alone. Thanks so much for stopping by today! Happy crafting!